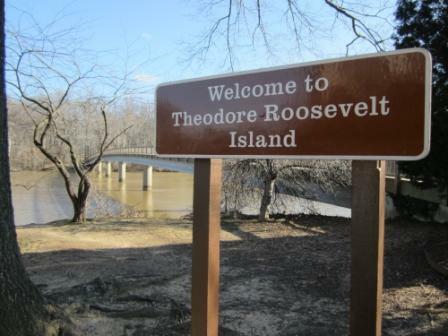 Many people who visit the FDR Memorial in D.C. don’t realize that his fifth cousin, President Theodore Roosevelt, also has a memorial nearby. In fact, he has a whole island named after him. 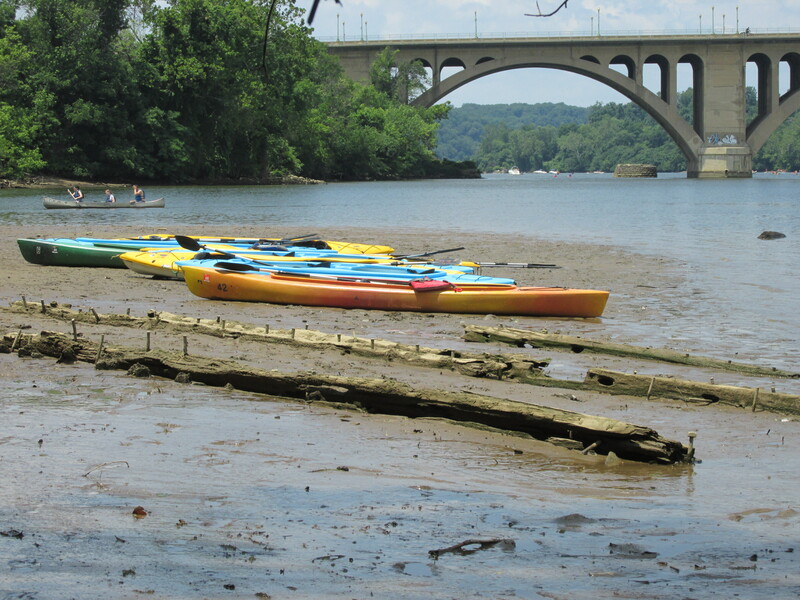 If you stand on the dock at the Washington Harbor in Georgetown (or the balcony of The Kennedy Center) and look across the Potomac River, you’ll see the heavily wooded national park blocking your view of the Virginia shoreline. Once known as Analostan Island and Mason’s Island- the most oft-used of many names- its recorded European history dates back to the 1600s. The Anacotan, Native Algonquin-speaking people, had several villages in what is now D.C. and most likely were the first ones to use, if not inhabit, the island. 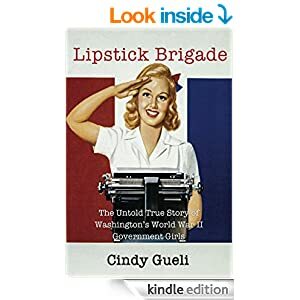 It’s got a cool history that illustrates the social and land-use evolution of Washington- private summer home for a wealthy Georgetown family; occupied by Union forces during the Civil War; training camp for African American infantry regiment; freedman’s refugee camp; returned to its natural state by landscape architect Frederick Law Olmsted, Jr.; cleared of structures by the Civilian Conservation Corps; and now operated as a memorial and hiking trails by the National Park Service. Union soldiers guarding what was then called Mason’s Island in 1861 during the Civil War. The Aqueduct Bridge and Georgetown University are in the background. View from similar vantage point today. 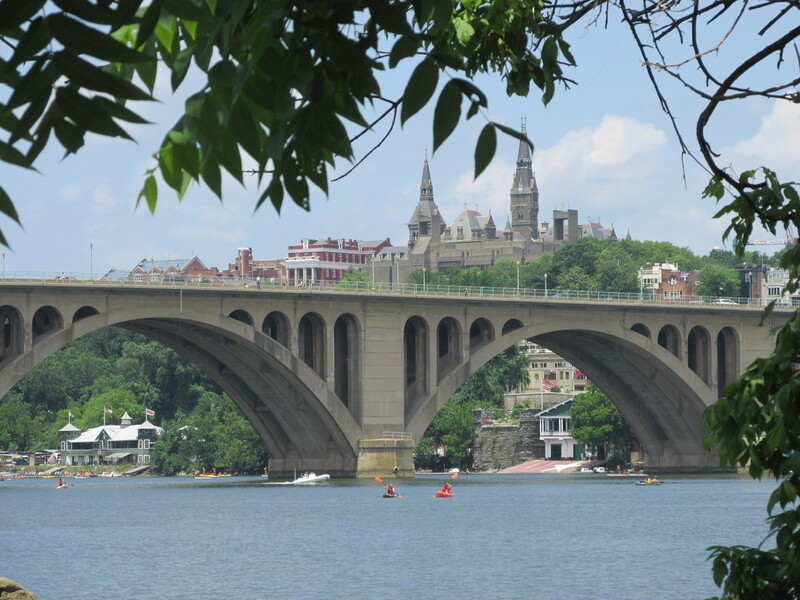 The Key Bridge (which replaced the Aqueduct Bridge in 1923) and Georgetown University are in the background. You can get to the island on a footbridge from Virginia or rent a kayak from one of Georgetown’s boat houses and paddle over. Once there, you can walk (with or without your dog) or run the paths, picnic on the tiny beach, or visit the very large statue of Roosevelt in the center of the island. Bring sunscreen, bug spray, and be ready to explore one of the more unusual presidential memorials in Washington.